While I was living, eating and breathing statistics a couple months ago, one of the few things that kept me from going insane was being able to plan a baby shower for a good friend of mine who was having a baby boy. I love planning showers and other parties. I don’t know why, but it’s fun. Whenever I have a project like planning a party or even decorating a room I need a source of inspiration. Sometimes it’s a picture, sometimes just an idea. For this one it was monkeys because isn’t that what all little boys are??? My MAIN source of inspiration was a ‘printable party’ from Parties by Hardie where she was able to customize everything for me and then all I had to do was print it off! I am definitely going to be doing it again. 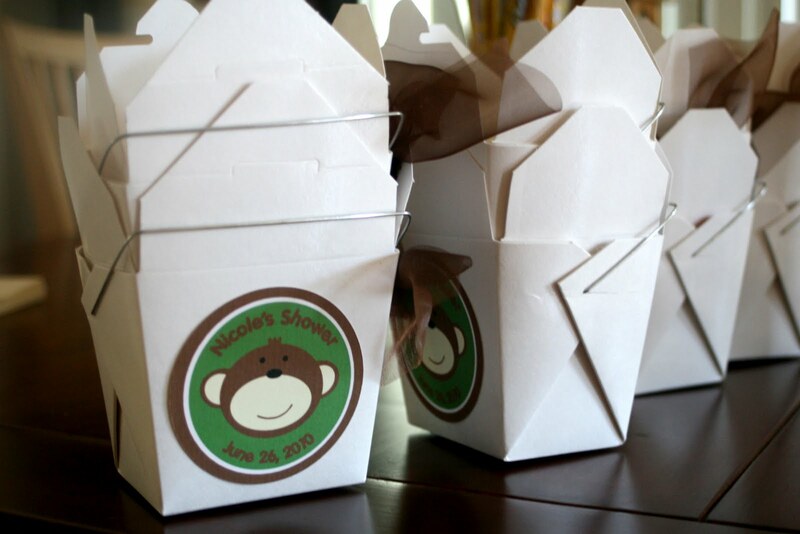 For party favors I got Chinese to go boxes from Cash and Carry (like costco but for food service in the NW) and used a circle printed out. Then I just tied a brown bow and good to go! There were filled with banana runts, banana flavored laffy taffy and other goodies. For the dessert I used my AMAZING super chocolate cake recipe and decorated it with little monkeys using two sizes of vanilla wafers and piped on frosting. And I can never get enough of these pom pom decorations! And who doesn’t love a good old fashion diaper cake? Cute shower! I love the monkey cupcakes those are adorable! What a fun theme! Love the colours, and all the food looks yummy, awesome looking cupcakes! Super cute shower! Love those monkey cupcakes. Wish I would have thought of that for my son's 1st monkey birthday party last month! Omygosh Kendra! I'm hiring YOU next time I do a party!!! I like doing them too, but I am NOT creative or inventive or anything like that. YAY for talented you! !